Nanaimo and Duncan drivers need a new experience, and Mazda sedans can give you exactly that. With the latest technology, a sleek interior, uncompromised performance features, and a number of safety features, each one of these vehicles will truly captivate the road. Learn more about these vehicles below. No matter what type of technology you enjoy, Mazda sedans are packed with information and entertainment features that are sure to please. Bluetooth technology ensures you can use your voice to make calls or stream music—providing the ultimate in convenience and safety. MazdaConnect technology ensures you connect your smartphone directly to your touchscreen so you can easily access your favorite apps, make calls, and much more. Keyless entry with push button start takes the hassle out of fussing with keys when wanting to just get in and go. When you hit the Nanaimo, Duncan, and Victoria road, you deserve to do so in comfortable style. The interior of every Mazda sedan was designed with that specific purpose in mind. No detail was left untouched when you take in the leather craftsmanship available on the seats for a more comfortable and sophisticated ride. Redesigned center console puts everything you need in an easy-to-access knob so you can always keep your eyes on the road. The spacious interior of any Mazda sedan offers comfortable seating for 5 and plenty of cargo space to haul all your favorite items and necessities. 60/40 split rear seats enhance the amount of cargo space found in each Mazda sedan, so you can haul what you need to haul, no matter the size. When driving a Mazda sedan, you can experience the power and precision that comes with each vehicle. Sit back and let these vehicles handle the road in a way you never thought possible. SKYACTIV® TECHNOLOGY creates a stellar performance for every Mazda sedan that hits the Nanaimo, Duncan, and Victoria road. Every Mazda sedan was built to offer an impressive fuel efficiency that allows you to enjoy more time on the road and less time stopping for gas. SKYACTIV®-G DOHC 4-cylinder engines offer an impressive amount of power that offers a smooth and enjoyable ride every time. Each Mazda sedan was built with iActiveSense, a set of nine standard safety features that were designed to help prevent collision and protect you in the event of one, creating the ultimate in peace of mind. Lane departure warning keeps your Mazda sedan in its desired lane by warning you if it starts to drift without signaling. Rear cross traffic creates a necessary visual by alerting you if vehicles or objects are approaching from either side while you’re in reverse. Blind spot detection offers an alert when objects are in your blind spot, helping to avoid collision at all costs. Adaptive lighting system moves with the Mazda sedan to ensure you always have a well-lit path. When it comes to style, the 2018 Mazda 6 truly breaks the mold. This vehicle offers a redesigned front fascia that includes a new bumper and grille with mass appeal. LED headlights and foglights save energy while also providing a necessary view of the Duncan and Nanaimo roads. Plus, you can receive up to 6.7L/100KM Highway thanks to a sleek design and cylinder deactivation that improves efficiency. On the inside, you can sit back and take in the sounds of an 11-speaker Bose system, heated and ventilated front seats, and new center console. To complement the 2018 Mazda6, the 2018 Mazda3 is another great option in terms of sophisticated style. The command control knob allows you to easily control the MazdaConnect features, so you can enjoy entertainment and information when you need it. The Active Driving Display also provides necessary information like vehicle speed and directions right in your line of sight, so you never have to take your eyes off the road. 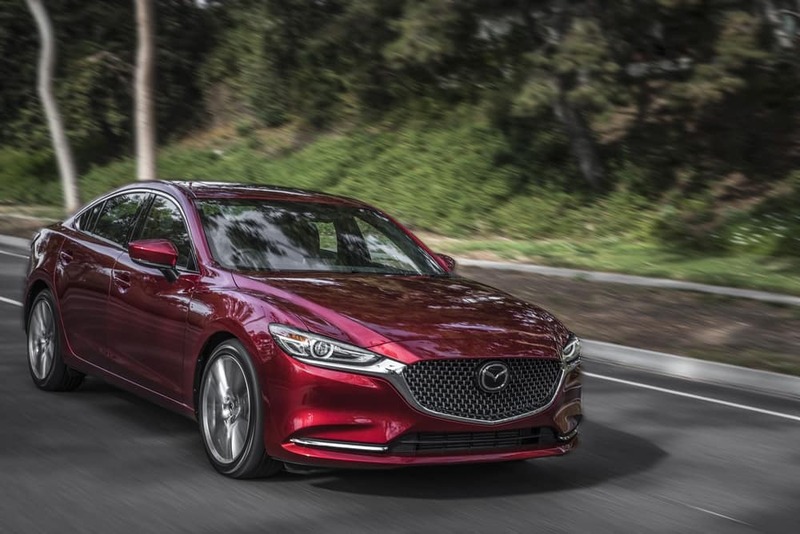 Couple this with a sleek racecar-like design and an EPA-estimated 6.2L/100KM highway, and you have yourself a must-have vehicle..
Mazda sedans dominate every road thanks to their attractive look and unparalleled performance. If you want a vehicle that drives like a racecar but functions like a family vehicle, then you need to visit Harris Mazda today to grab one for yourself. We have an extensive inventory of new vehicles for you to choose from, and our iBuy responsive sales approach is one that you’ll never forget. Contact us today at 250.758.9125 to start enjoying a Mazda sedan in Nanaimo, Duncan, and Victoria right away.